When I first came to Turkey, despite knowing Istanbul was the country’s largest city and top visited tourist destination, nothing quite prepared me for realising just how intense the city really is. As well as being the centre ruling capitals for both the Byzantine and Ottoman empires, the neighbourhoods of Istanbul each have their own story to tell. Indeed touring local suburbs is now a popular travel genre and Istanbul is no exception because most local excursion agents now sell guided walking tours. Since my first visit, I’ve read many books about Istanbul and returned three times, yet I’ve only visited a fraction of what there is to see. Indeed, to fully know and appreciate the city, I would need to move there for at least a year. So for this article about neighbourhoods of Istanbul, I’ve enlisted the help of my friend Bayram who sells Istanbul real estate and is knowledgeable on the unique characters of each district. Separating the city into the European and Asian sides, he explained each area is much like anywhere else in the world because they each have a particular genre or stereotype. For example, while one may be the business district, another is an upmarket destination and is a hangout for artists or the centre of nightlife. Naturally, from a visitors point of view, Sultanahmet should be first on the list because it is a UNESCO world heritage site brimming over with historical landmarks from the Byzantine and Ottoman empires. The choice of hotels from hostels to five stars is mind-blowing and as with any other touristic destinations, restaurants cater for the masses by serving a variety of domestic and international cuisine. If your main reason for visiting Istanbul is to see the highlights like the Blue Mosque, Hagia Sophia, and Topkapi Palace, then Sultanahmet is the place to stay. 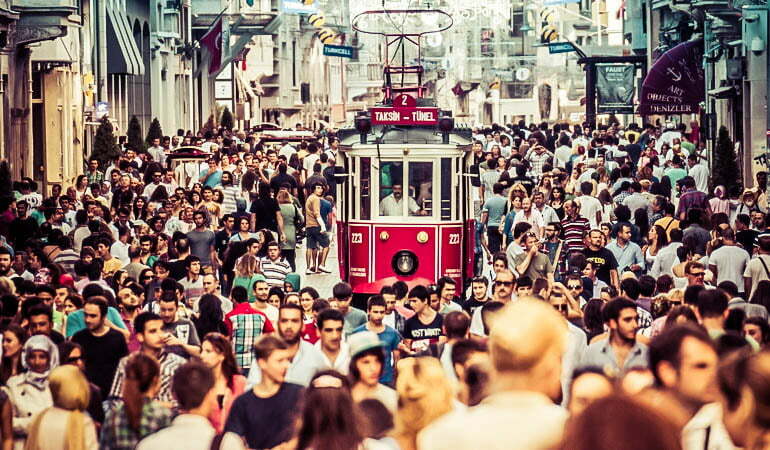 Typically characterised by Istiklal Caddesi, the central pedestrian thoroughfare and busiest street of Turkey, Beyoglu is the alternative face of Istanbul. As a favourite hangout in history for foreign dignitaries, it is now a centre for shopping and nightlife, and some of the city’s most prestigious hotels. The new and modern hasn’t overtaken all of it, though. 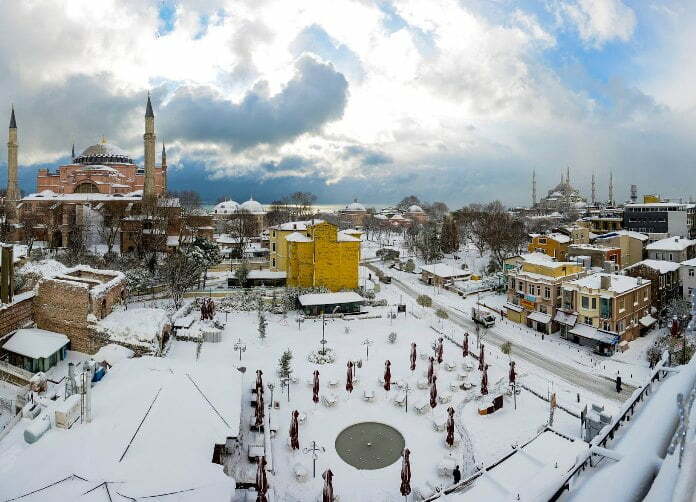 Some marvellous gems reflect the art and culture scene like Saint Anthony Padua Church, the antique shops of the Cukurcuma district and Orhan Pamuk’s (Turkey’s most famous Turkish author) Museum of Innocence. The Pera Museum holds the Tortoise Trainer painting, one of the most expensive ever sold in Turkey, and when I spent time here, I greatly favoured the smaller neighbourhood of Galata on the outskirts and its dramatic 360 panoramic views from the tower. 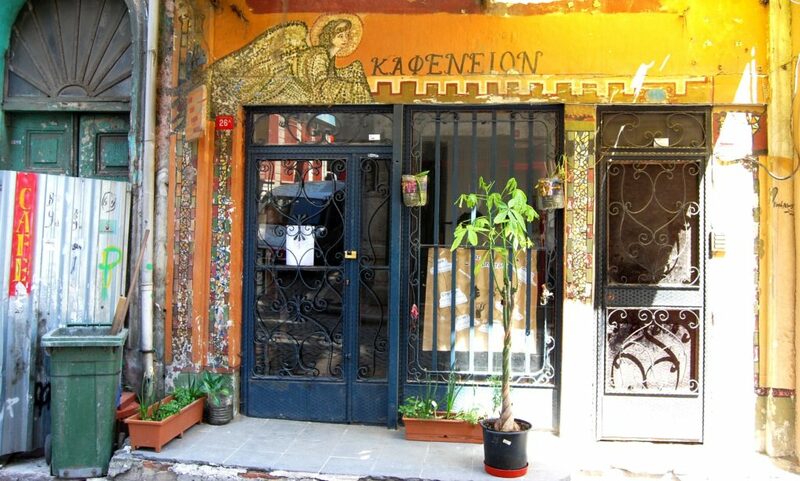 Growing in popularity for guided walking tours, these two districts reflect Jewish and Greek heritage, a lesser-known historical fact of Istanbul. Fener was previously home to many wealthy Greeks, as proved by Saint Georges Church, otherwise known as the Ecumenical Patriarch of Constantinople. Balat, a historical settlement area for Jews, is also home to the oldest synagogue in the city that is Ahrida. 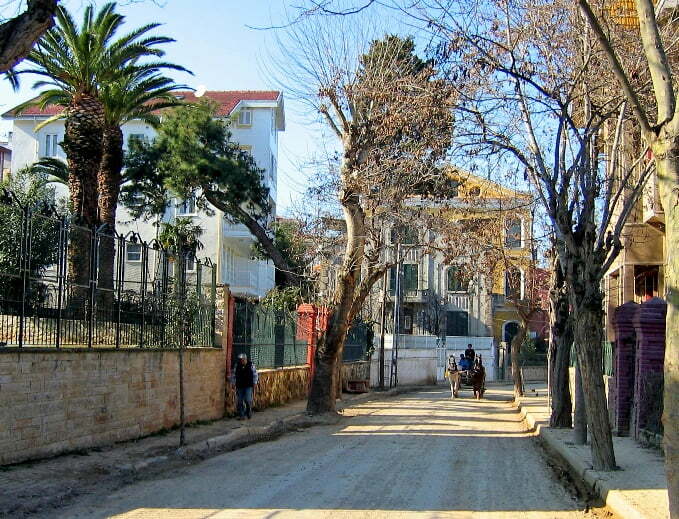 Both districts faced ruin after many years of neglect until 2003 when a substantial amount of money was pumped into restoring the old Ottoman houses. As well as highlighting their history, popular guided walking tours display authentic local life as seen in the homes, businesses, and locals. Most people probably associate Besiktas with the famous football team, but it is about a lot more than that. Easily reached via a walk or bus ride from the Taksim area, the famous Dolmabahce Palace, sitting next to the clock tower and mosque of the same name is worth visiting. As last home to the Ottoman sultans, the wealth and decadence within those walls boggles the mind. Heading further up Ciragan Caddesi, past the naval museum (Deniz Muzesi) and one of Turkey’s most expensive hotels, the Ciragan Palace, we arrive at the Ortakoy district. 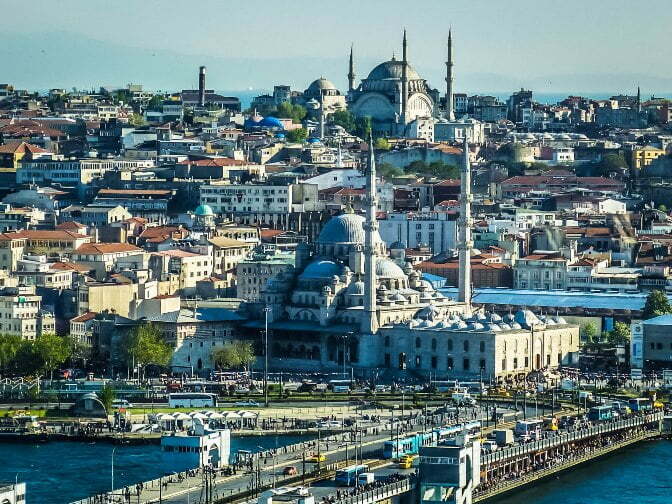 It’s mosque fronted by the famous Bosphorus Bridge is a favorite postcard and travel guidebook scene of Istanbul. 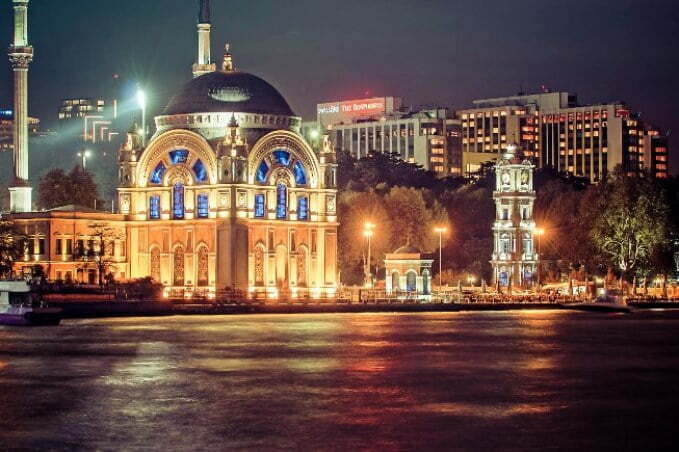 Also popular at nighttime for its fish restaurants and nightclubs, Besiktas is home to Yildiz Palace Complex and Museum, one of the city’s famous green areas and park. Sitting next to the entrance of the famous Galata Bridge, Eminönü is the place to pick up a cheap ferry tour of the Bosphorus. Balik Ekmek (fish sandwiches), is the favoured cheap street food otherwise, restaurants under Galata Bridge serve delicious albeit pricey fishmeals. In the Bahcekapi district of Eminönü, a small shop and living museum showcases the rise to fame of the humble Turkish delight. Owned by descendants of the inventor, Haci Bekir, it is of great interest to both locals and tourists. The most famous landmark in this district though is the Suliyeman mosque compound dating from 1557 and now a UNESCO World Heritage site. For a shopping experience, the busy spice market fairs well, but it is worth walking the extra distance into the Beyazit area, home of one of the world’s oldest and largest marketplaces. The chaotic Grand Bazaar and its labyrinth of shops and passageways may seem intimidating to the newbie shopper in Turkey, but you will eventually get into the swing of exotic bargaining and banter of the 4000 unique shops. From here, if a day of sightseeing and touring the main landmarks leaves you weary and worn out, the Cagaloglu Hamam is a traditional and most importantly authentic Turkish bath experience. Dating from 1741 and well known for its beautiful architecture, famous visitors from history include Florence Nightingale. Technically, the Princess Islands are not a neighbourhood but are worth knowing about because Büyükada (the largest island) and its pedestrian streets are a recommended tourist attraction. Originally, places of exile for Byzantine and Ottoman dignitaries, old mansions lining the streets display typical Ottoman architecture trends, and because vehicles can’t be used, horse driven carriages are the best method to tour the island. Often overlooked in mainstream travel guides, Nisantasi is an elite and upmarket neighbourhood where the main word on the tongue is money! Osmanbey, which is the heart of the area, is home to Abdi Ipekci Street, the most expensive street in the whole of the country. Its premier status stems from luxury shopping brands including Louis Vuitton, Armani, and Dolce Gabanna, who have rented shops in the district. Combined with the international eateries, if money is no object, Nisantasi could be right up your street!